Mayor Bill de Blasio released his plan for providing more than 73,000 universal pre-K seats to city children, paid for through a tax increase on city residents earning $500,000 a year or more. CIVIC CENTER — Mayor Bill de Blasio could potentially use space in New York Public Library branches and New York City Housing Authority buildings to meet his goal of providing full-day universal pre-K to all city students by fall 2015, the mayor's office said Monday as de Blasio headed to Albany to make the case for his plan. To convince state lawmakers to approve a tax increase to fund his ambitious pre-K expansion, de Blasio released a detailed blueprint Monday showing that the city will need to come up with more than 30,000 seats by this fall. According to de Blasio's plan, the city will guarantee close to 54,000 full-time universal pre-K seats for city students by September 2014. That's a huge jump from the 16,119 full-time seats currently available inside public schools, as well as the more than 3,000 full-time seats available in community-based organizations, according to the joint report prepared by the mayor’s office, the Education Department and other agencies. By the fall of 2015, the city will add another 20,000 full-day seats, aiming to have enough spots for every one of the estimated 73,250 4-year-olds, the mayor's office said. The city may make room for some of these seats by using space in other city-owned properties, such as "space in branches of the New York Public Library," according to the report. The mayor's office added that the city would also look to use space inside public housing complexes. The new pre-K seats come with a price tag, and de Blasio hammered home his plan before Albany lawmakers on Monday to pay for the seats through a tax increase on city residents making $500,000 a year or more. "Together, let’s use the budget process we’re engaged in to address the top priority we’ve outlined today: The crisis of inequality in our city and our state. And universal pre-K and quality after-school programs do just that. We can level the field for our kids — every child in every borough of our city — by asking those who make more than half a million dollars a year to pay a little more in taxes," de Blasio told the joint fiscal committee Monday, where Council Speaker Melissa Mark-Viverito was expected to speak as well. The mayor’s report estimates the cost of the universal pre-K plan to be $340 million per year, with the average cost of $10,239 per child. In addition to potentially using library and NYCHA space, the mayor's office plans to generate the needed seats through a combination of converting the more than 27,000 existing half-day pre-K seats in public schools and community-based programs, as well as getting non-Universal Pre-K-compliant programs into the fold, sources said. That includes converting 877 half-day seats currently devoted to students with disabilities into full-time programs, the report says. The new UPK system will implement the state’s harder Common Core pre-K standards to ensure a consistent high standard for each child enrolled, the mayor's office said. Critics say de Blasio will have an uphill battle to make his case in Albany after Gov. Andrew Cuomo — an outspoken opponent of raising taxes — has offered to have the state write the city a "blank check" for UPK programs. “No one has a big interest in the tax component,” one Albany insider said, adding that there was a growing belief in the state capitol that the tax increases were a surreptitious way of funding the city’s looming public employee union contracts. Opponents of de Blasio's plan have hinted that he wants the tax hike for more than just pre-kindergarten costs, and that he would seek to use them to plug gaps in other city budgets such as labor costs. But in de Blasio's report released Monday, he reiterated that the new tax revenue would be "dedicated solely to the expansion and enhancement of New York City’s pre-kindergarten and after-school programs," and promised to keep them in a special "lockbox" similar to the way former Mayor David Dinkins used tax funds to pay for the "Safe City, Safe Streets" program in the early 1990s. "There are some who whisper that our drive to tax the rich to fund pre-K and after-school is just political posturing — an effort to heap scorn on the wealthy to win an election," de Blasio told lawmakers Monday. "We don’t want to punish the wealthy for their success... 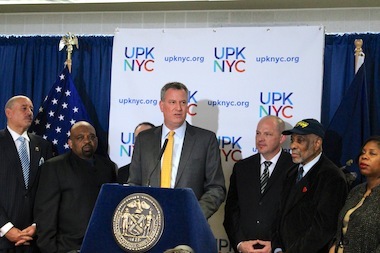 This is about the children of New York, and just how strong of a commitment we are willing to make to their futures."